To participate, please fill in the registration form below. If the registration form does not appear properly in your browser, please register by email or fax, sending registration entries below. Information provided will be used only for purpose of symposium management. *Admission will also be allowed on day without prior registration, however, if reservations exceeds seat capacity, priority will be given to first registrants. 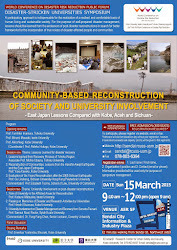 "Community-Based Reconstruction of Society and University Involvement: East Japan Lessons Compared With Kobe, Aceh And Sichuan"